Fashion, music, arts and fun - what else do you need for the perfect weekend in Athens? Don&apos;t miss blvd. Magazine&apos;s three-day fashion extravaganza this weekend, showcasing local art and fashion with runway shows, music events and dance parties! Thursday: Start off your fashionable weekend with an evening of fashion, food, drinks, live music and beautiful scenery. The 2nd annual "blvd.&apos;s House of Fashion" is a fashion show showcasing summer looks from local boutiques such as Rouge, George Gibson, Flaunt and Agora. Food and beverages will be provided as well as music by The Big Fundamentals and DJ Winston Parker. Festivities will begin at 6 p.m. at the Stan Mullins Garden located on 650 Pulaski St. Admission is only $8, and all proceeds benefit the Athens-Clarke Heritage Foundation. Friday: The Athens Area Arts Council (AAAC) will host "Material World: Art Meets the Runway" from 7 to 11 p.m. at Hotel Indigo. This fashion show will feature textiles and wearable art from local designers as well as complimentary hors d&apos;oeuvres from Athens area restaurants. Following the show, Sonny Got Blue will play in the Rialto Room. 50 percent of all bar sales benefits the AAAC. RSVP on Facebook! Saturday: To wrap up the weekend, you are invited to dance the night away! UGA Style will host "Spring Scene," a FREE fashion party at Max Canada from 10 p.m. to 2 a.m. with music provided by DJ Graverobbers. Don&apos;t forget - dress to impress! 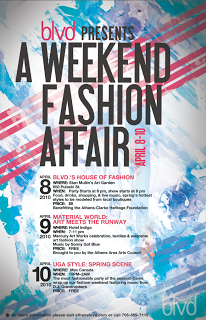 For more information on "A Weekend Fashion Affair," go to athensblvd.com.